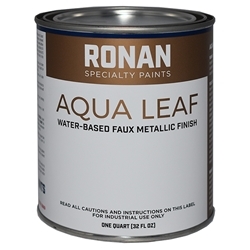 Aqua Leaf Metallic Paint 8 oz Cans - Aqua Leaf is a water based, lead free, non-gassing, metallic-like finish coating with built in ultraviolet protection. It is formulated with an acrylic resin to provide an extremely durable, flexible, weather and fade resistant, bright metallic like look. It is made with non-tarnishing nacreous pigments (mica particles) which yield a lustrous metallic look. Aqua Leaf exhibits excellent adhesion to wood, metal, canvas, glass, plaster, treated and untreated vinyl and many other substrates. Non-flamable, low odor. Estimated coverage 25 square feet per can.